Saptapadi is a Sanskrit word, which literally translates to Seven Steps. 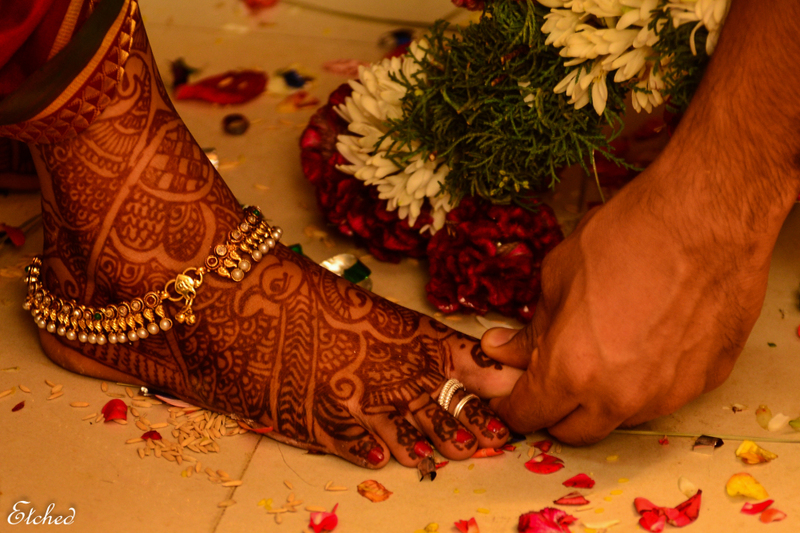 It is an important Hindu Wedding Ritual, where the groom helps the bride touch seven betel nuts with her Right Toe. Also referred to as Seven Steps or the Seven Vows or the Saat Vachan. During the wedding, the groom leads his bride to touch one of the seven laid out betel nuts with her right toe, after the completion of each Phera or Circle around the Sacred Fire. According to the Hindu Law (Yajnavalkya Smriti), only after the completion of the seven steps is the marriage considered as complete, for all legal purposes. Very often, Saptapadi is confused with Saat Phere. Saptapadi is the rite where the couple takes seven steps in the north-east direction at a slow and measured pace. With each step, the bride and the groom take a vow together. According to the Hindu tradition, it is believed that if two people walk seven steps together, then they remain together for their entire lifetime. The actual significance of Saptapadi lies in the fact that the married couple prays not only for their own welfare but also for the health, happiness and prosperity of all. This is an integral part of all Hindu marriages, irrespective of the tradition or custom followed, the way in which these seven steps are taken differ from place to place. In some South Indian weddings, the seven steps are taken towards the South direction, while the groom holds the little finger of the bride and then goes around the sacred fire. While in some weddings, the groom holds the hand of the bride and leads her around the fire seven times.